Unless otherwise stated, our services are for people in receipt of state benefits, this includes Job Seekers Allowance, Employment Support Allowance, Disability Living Allowance and Working Tax Credit, any of which must also be accompanied by Housing Benefit and/or Council Tax Support. Individuals on a low income and receiving Housing Benefit and/or Council Tax Support, or senior citizens in receipt of a State Pension, are also eligible to use our services. 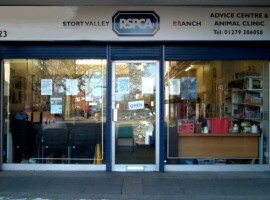 We recognise that some of our neighbouring branches don’t have RSPCA clinics, so we are prepared to see clients from outside our branch area (in our neighbouring branch areas). Hopefully this will help many more animals and their owners from the surrounding areas. We do not have operating or X-ray facilities, if these are required then a referral to a private vet will be given. If the client is from outside our branch area and is needing financial assistance towards a procedure at a private vet, then Stort Valley will have to direct them back to their own branch administration for this. You can check as to whether you are inside our branch area on our postcode List & maps.